Exotic pets can make interesting companions, and the bearded dragon is no exception. Keeping a dragon as a pet sounds like something out of a fantasy novel, but a bearded dragon is a real possibility. Bearded dragon is the common name for the Pogona, a genus of reptile found in Australia. Their natural habitats include savannahs, woodlands and dry, arid regions. They are popular pets in Australia, although the country banned sales of them to the pet industry in the 1960s. They became popular in the United States in the 1990s, and the bearded dragon pets we see today are likely bred from specimens smuggled into the country illegally. The most popular bearded dragon in the United States is the Pogona Vitticeps, also known as the central bearded dragon. The common name originated from the rows of spikes on their triangular-shaped heads, which appear similar to a beard when puffed up. The body is flat and muscled with 4 bulky legs. The tail is shorter than the body and does not regenerate. Bearded dragons can grow up to 24 inches long including the tail. They live in the wild for 3–5 years, but those raised in captivity can live for 10–15 years. Males are usually larger than females, although development depends on the individual reptile. Other factors include breed, diet and health. A bearded dragon diet is usually a combination of insects, fruits and vegetables. 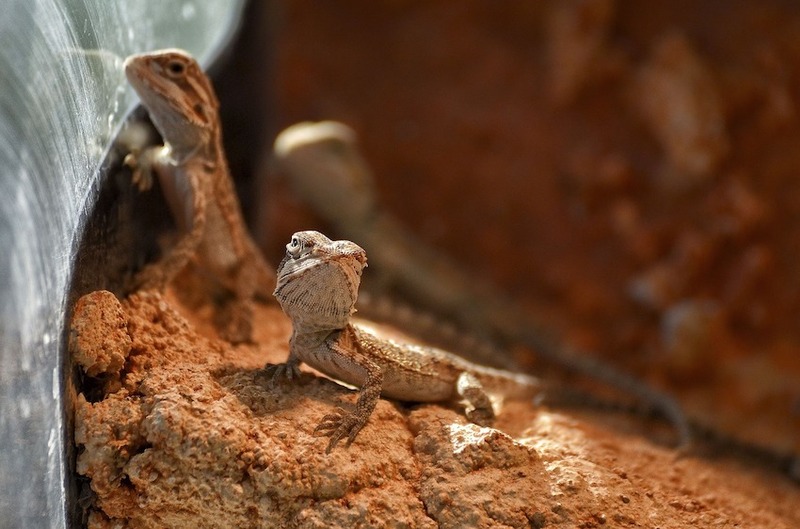 Insects eaten per day can vary from 20 to 60 depending on size, with the larger number typical for baby bearded dragons. 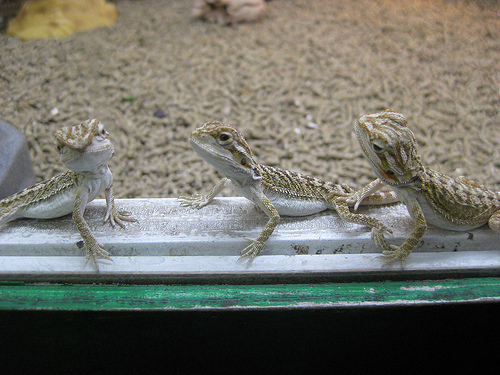 The baby bearded dragon diet is usually split into 3 separate feeding sessions, and uneaten insects should be removed. Fresh, shredded fruits and vegetables should also be offered. Vegetables are sometimes fed to the insects first (called gut loading), then the nutrient-rich insects are fed to the bearded dragon. Large insects can cause blockages in the digestive system, so smaller insects are prepared for young dragons. Insects can be coated with calcium as a nutritional supplement. An older bearded dragon’s diet includes larger insects but less often — usually once per day. As they age they will eat more of the fruits and vegetables offered. They can become picky about what they eat, so different fruits and vegetables should be shredded and mixed well. Bearded dragons should never be fed iceberg lettuce or a high-fiber diet. These bind to calcium and make it unable to be digested. Buy insects from a pet store or feed supplier. Never feed your bearded dragon any insects from around the home, because they might contain pesticides or parasites. Keep the insects in a secured container away from common areas. Clear or see-through materials are not recommended unless you want to freak out bug-phobic guests, since the bearded dragon diet typically includes crickets, worms and cockroaches. This video shows how a caretaker feeds and breeds his own insects to use as his bearded dragon’s diet. At the end, you can see 2 of his bearded dragons and one in the process of shedding. The size of the habitat will depend on the size of the bearded dragon. Baby dragons should have a 20-gallon tank. As they grow, they will need larger habitats. Getting one too large can make it difficult for a younger reptile to catch its live food. Glass aquariums are the most popular habitat; they are inexpensive but can be heavy. Melamine wood board cages can be made or purchased, but they tend to be expensive and heavy. PVC cages are lighter and look like a smoother version of melamine, and they are expensive. ABS cages are plastic, lightweight, sturdy and stackable. Vision cages are made from one piece of plastic; these expensive cages are chemical-resistant, easy to clean and can be stacked. A screen lid is recommended to cover the tank instead of glass or plastic. Solid covers can increase the humidity in the tank, and this can lead to health problems. Lighting should include UVA/UVB tubes to mimic the natural sunlight dragons are used to in the desert. The lights should run the length of the tank and need to be replaced every 6 months since they lose strength over time (they may still illuminate but will not be emitting UVA/UVB). These lights do not generate heat the way a basking light does. Basking lights produce the heat needed for these reptiles. They are sold individually or in combination packs. Stick to lights made specifically for reptiles; other types of lights can cause negative health effects. A branch of climbing surface may be needed for the dragon to be positioned closer to the basking light. The temperature inside the tank is important, and it is helpful to have a thermometer at both ends. One side of the tank should remain around 100 degrees Fahrenheit, and the other side should be cooler to around 85 F.
Overnight temperatures can be lower but should not drop below 65 F. Humidity gauges are also recommended to prevent the humidity in the tank from becoming too high. Avoid heated rocks because they can burn the underside of a dragon. Flooring for the habitat (substrate) depends on the age of the reptile. Young bearded dragons should have newspaper, paper towels, tile or reptile carpet. Avoid using loose, shredded or chipped substrate and sand since it could be ingested by young dragons during feeding. Never use bark, shells, mulch, cork, pebbles or gravel. Calcium sand substrate is a good choice for adult dragons. Avoid any substrate with artificial dyes. No matter the size of the tank, it is recommended to separate males to prevent fighting. Brumation is a natural hibernation cycle occurring in winter or fall. Some dragons will nap periodically or sleep through an entire cycle, but this depends on the individual reptile. Skin shedding is more frequent in younger reptiles, but adults may still shed 1 or 2 times per year. Skin should be allowed to shed naturally; warm water baths and misting is recommended. Impaction is a blockage in the digestive system. Warm baths and massaging can help, but a veterinarian visit may be needed. Dehydration is seen by the signs of sunken eyes, wrinkled skin, lack of appetite or a lack of energy. This can be treated with water and Pedialyte. Kidney problems may be evident by droopy eyes. Swollen eyes can be a sign of shedding, a vitamin A overdose, infection or parasites. Paralysis can be caused by an oversized piece of food putting a strain on the spinal cord. Malnutrition can be caused by a lack of vitamin B1 or an overdose of vitamin A.
Metabolic Bone Disease (MBD) is caused by a lack of calcium, vitamin D3 or phosphorus. Symptoms include bumps in the legs, back or tail, twitching or tremors or a swollen jaw. Mouth rot is marked by a yellow or white substance near the mouth which may be accompanied by a lack of appetite. Respiratory infection is rare but possible, and symptoms include gaping at the mouth, breathing problems, puffing up or mucous from the mouth or nostrils. A risk of contracting an infection from your bearded dragon, such as salmonella, is possible. 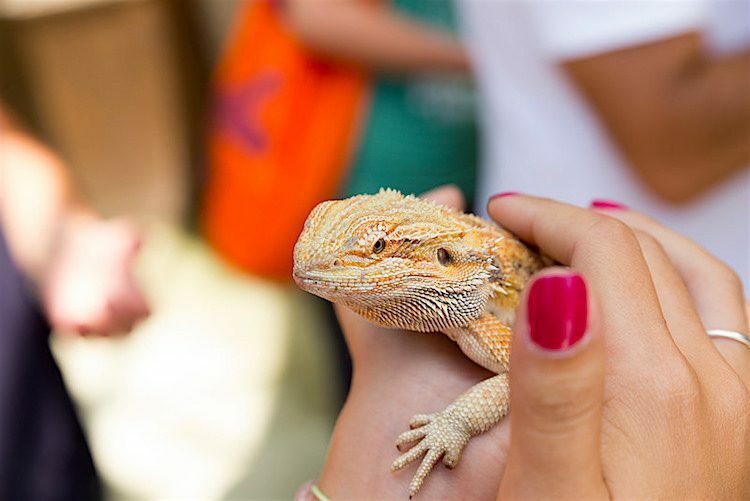 The Centers for Disease Control and Prevention reported a salmonella outbreak in humans in early 2014 who handled bearded dragons in several states. Be sure to wash your hands after handling your dragon. Is a Bearded Dragon a Good Pet for You? Initial habitat purchases could be expensive, but feeding costs should be less. The time involved in raising insects, monitoring temperature and humidity, and feeding your bearded dragon should be taken into consideration. This is not a pet you can place in a tank and forget about, and the list of possible health problems is long. 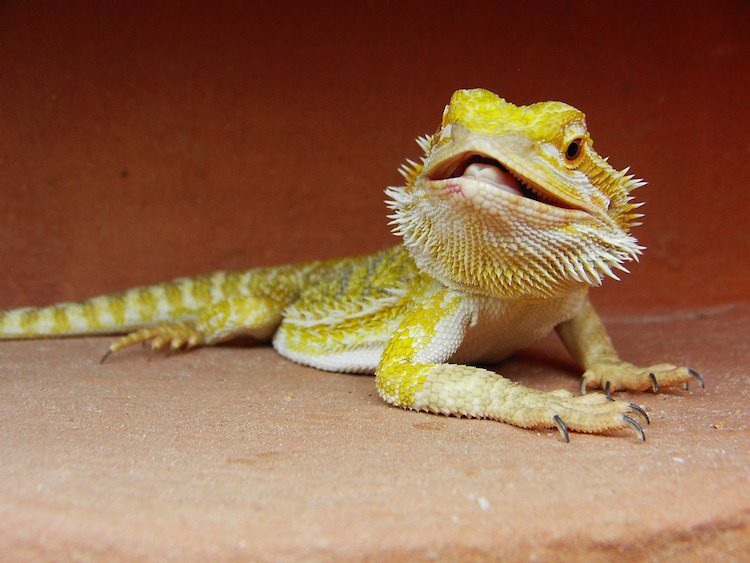 A nearby veterinarian trained to work with reptiles will be needed, so find out if one is near you before taking on a bearded dragon as a pet. If the requirements for this reptile don’t seem demanding for your budget and schedule, a bearded dragon could be a great pet for you.